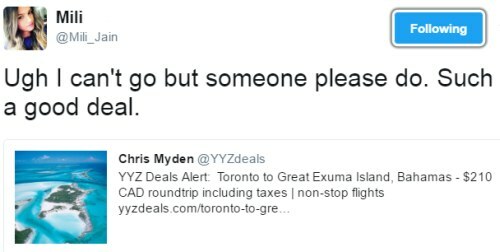 Air Canada Rouge is selling off some last minute seats from Toronto to the exclusive island of Great Exuma in the Bahamas. It will show up as $310 per passenger at first, but will drop to $210 per passenger on the next page. When you see $420, that's the total roundtrip price for 2 passengers. It will show up as $250 per passenger at first, but will drop to $200 per passenger on the next page. When you see $400, that's the total roundtrip price for 2 passengers. 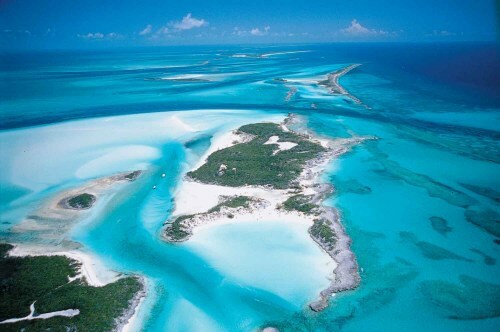 Update 6/7 - June 11 to 18 from Toronto to Great Exuma Island, Bahamas is now down to $150 CAD roundtrip including taxes! The price will show up as $200 at first, but drop down to $150 CAD on the next page. If you see $300, you may be searching for 2 passengers, and that is the total for 2 passengers. However, Airbnb does currently have a few options for under $100 CAD/night for 2 people. There's currently an option for $87 CAD/night for a property that has 5 stars after 90 reviews. 2 Responses to "Toronto to Great Exuma Island, Bahamas - $150 to $210 CAD roundtrip including taxes | non-stop flights"
Booked!! This site is amazing... Thanks for finding these great deals!!!!!! Excellent, no problem, have a great time in the Bahamas!